After each CCD bakeout, the contaminant layer on the XRT CCD gets thicker with time. Since the thickness of the layer impacts the temperature sensitivity of XRT, we routinely estimate the thickness by using G-band (and Light Leak) data. Click the year in the left of the page to see the calibration results. Each plot covers a time period from one CCD bakeout through the next bakeout. The left panel shows the temporal variation of visible light enhancement in G-band or Light Leak observation. 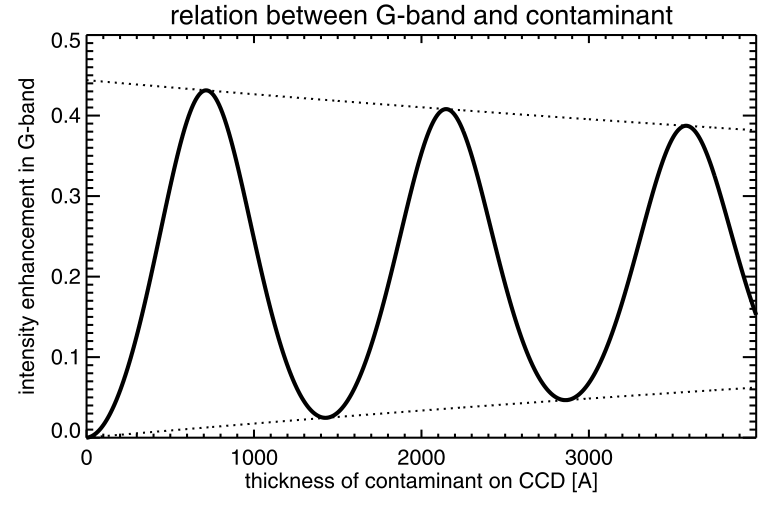 We can derive the thickness of the contaminant layer by using the conversion function (Figure 27 in Narukage et al. 2011). The estimated thickness are plotted in the right panel. The fitting line (red) is also shown in the panel. The vertical blue and red lines show the end and start time of each CCD bakeout. The database of the layer thickness will be distributed through SSW. The update of the database and the addition of a new plot will happen about once per three weeks.